The only energy a hand-powered cylinder mower uses is your own; and if you have an area of grass to cut that is not too extensive it would be madness to use anything that relies on unsustainable sources. 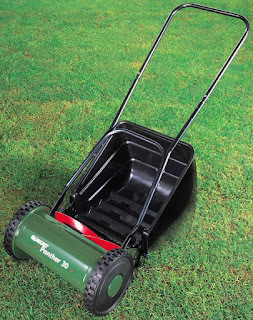 We bought one for about £20 a few years ago but it was pretty cheaply made and, after using it to mow uneven allotment paths as well as in the garden, it started to fall apart. Having learnt that you have to use them regularly and on fairly even grass, we upped our investment to the forty quid mark and went for one made by a well-known lawnmower manufacturer. By happy accident, when I was researching this particular model, I realised that a previous version of it, dating from as early as the 1930s, was the mower that my granddad used to let me ride precariously on the front of as a kid – this was before the invention of modern parental anxiety - as he pushed it up and down to create that bowling green effect in his back garden. The current version is sturdy but light and provides an excellent opportunity for regular exercise; but the best thing about it is there is no more delightful sound on a summer’s day than the gentle whirr of a push-mower - much more pleasing than the insistent whine of electric or the deafening thrum of petrol. Couldn't agree more! We had, when we had grass, the exact same model, The Panther. My father too, had an ancient blue one which lasted until the invasion of the Flymo's in the 80s. The cylinder mower without the collecting bucket and pushed at high speed will even slash into quite overgrown grass where powered mowers strugggle and gash the ground up. Happy mowing my friend!